By default, discounts are computed based on 'Compare at' price (Suggested retail price, MSRP) when it is set, otherwise on Price. For example, say an item costs $100, and Wholesalers have a 50% discount. 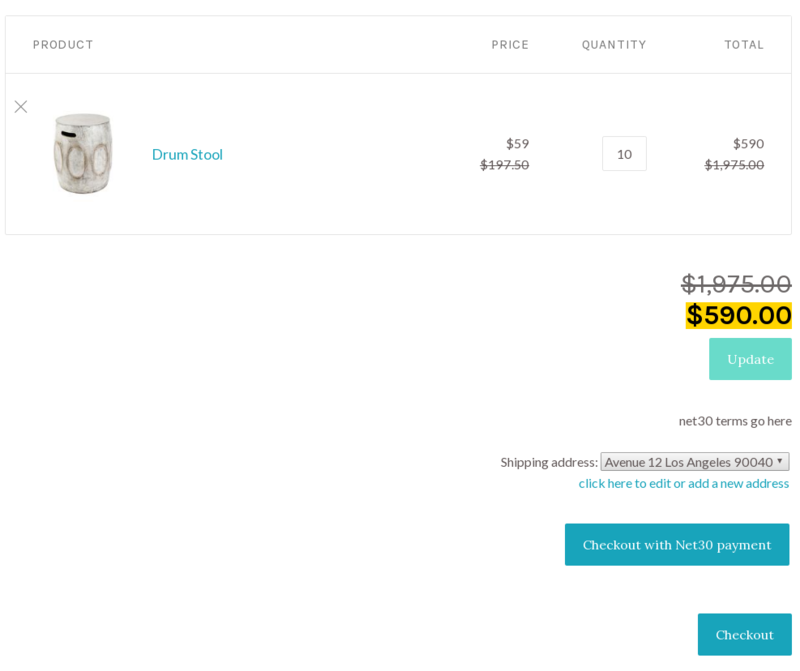 At some point you put the item on sale at $70, while leaving the Compare at price to $100. Regular customers will pay $70, and Wholesalers will pay $50. If the item is on sale at $40, then everybody will pay $40 for it. You can change the base price to sale Price field in Settings. Multiple customer pricing levels, each customer type having different discounts, work fine. Note: Shopify Discount codes can be used on orders with Wholesale discounts only if you enable this in app Settings. 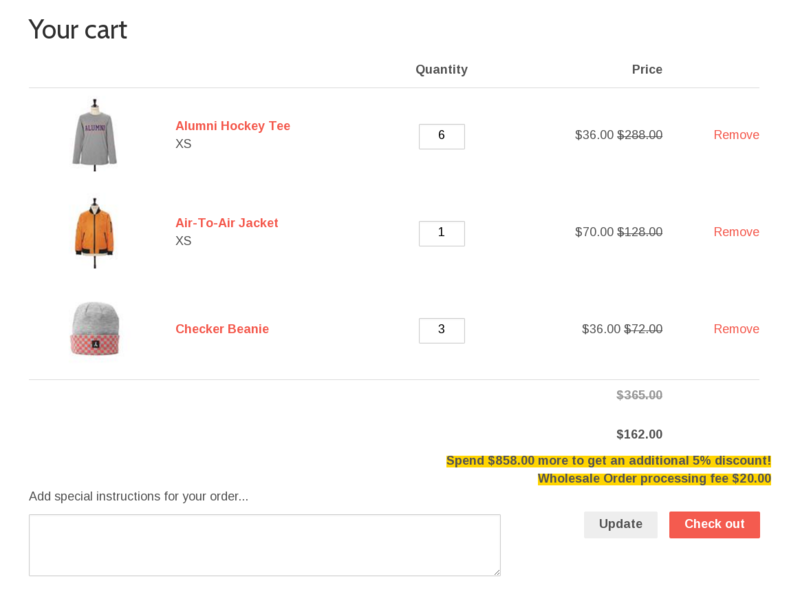 By default, wholesale orders don't accept discount codes. If percentange discounts aren't offering enough flexibility for you, set custom prices for each product variant. Bulk Edit prices in the app, or Export/Import as CSV. Note: requires a $99 one-time (lifetime) fee to setup, while still keeping the $24 subscription plan. As we don't duplicate product variants like other apps, we avoid issues like out-of-sync inventory, pausing before making product updates or having wholesale prices show in Google feeds. See reviews for more feedback from merchants like you, e.g. "Have really enjoyed the fact that it doesn't create variants for each product discount. This has re-enabled us to use Shopify's inventory management feature (previously impossible with other solutions)." How to organize wholesale or member discounts? 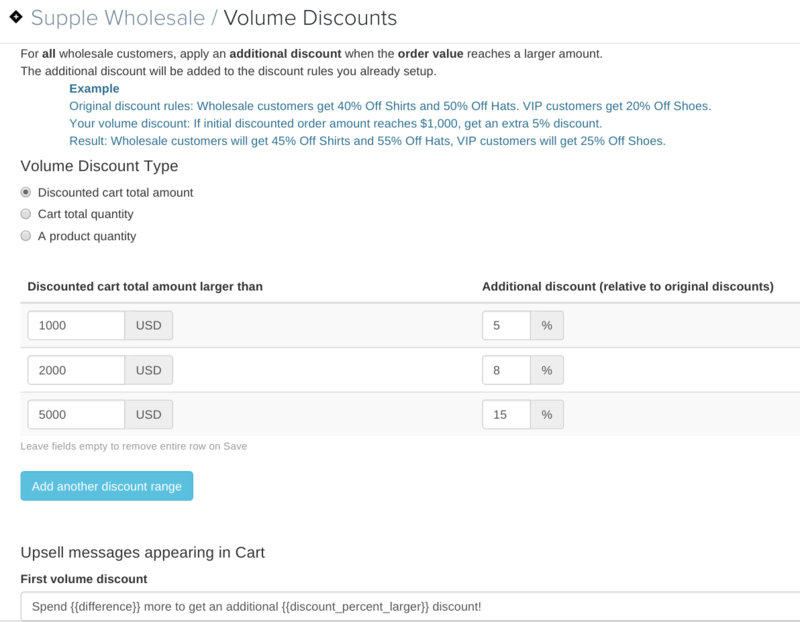 Create various discount rules for the same customer tag, e.g. Simply set desired prices for each customer type in a spreadsheet, and import those in the app. First, add some default discount rules (e.g. "wholesale" customers get 0% Off everything), which apply unless a product has specific prices set. 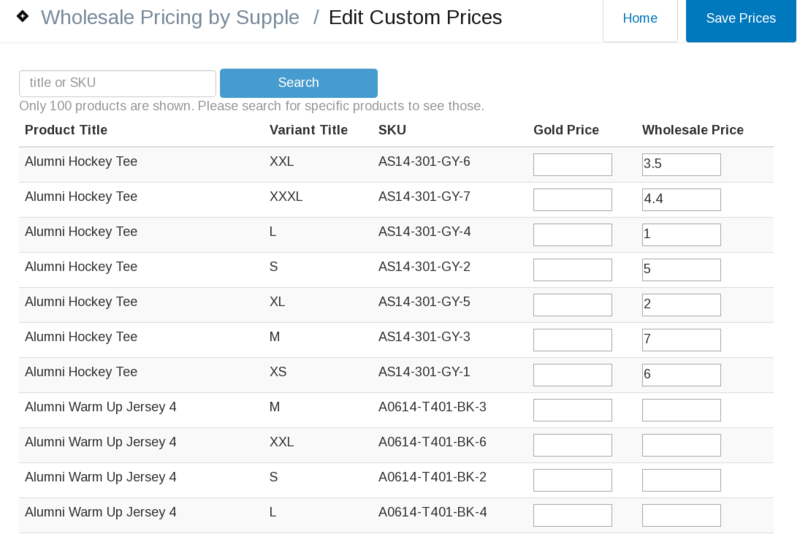 Then go to Edit Custom Prices, or download a CSV file where you can put your own custom prices for each variant, and import. Note: while this feature is available even in the Basic subscription plan, it requires a $99 one-time fee to setup. Only approved Wholesalers (customers that you tagged) see discounted prices as they browse the shop. Non-applicable customers (e.g. not signed in, or not tagged) see only regular prices. In cart, net30 customers will see an option to Choose a Shipping Address and "Checkout with Net30 Payment" (you can edit label and terms text) After clicking "Checkout with Net30", customers are shown a Thank you page on your store. You can name the net terms checkout button(s) as you prefer, e.g. "Invoice on Account", and you can have more, e.g. net15, net30, net45 (no extra fee). The app doesn't collect payments, nor sends reminders. You will have to followup with the customer to collect payment. Order is created with wholesale prices for each line item, and the optional Extra fees/Shipping that can be set in app also apply. Orders are tagged with 'termcheckout' and the customer wholesale tag. You can search for tagged orders and Save search as a tab. In some countries, retailers and resellers don’t pay sales tax on wholesale purchases. To enable tax exemption for desired customers, go to Customers section and edit customer Overview. For each customer group, you can require a minimum order value or quantity in order to get the discount. 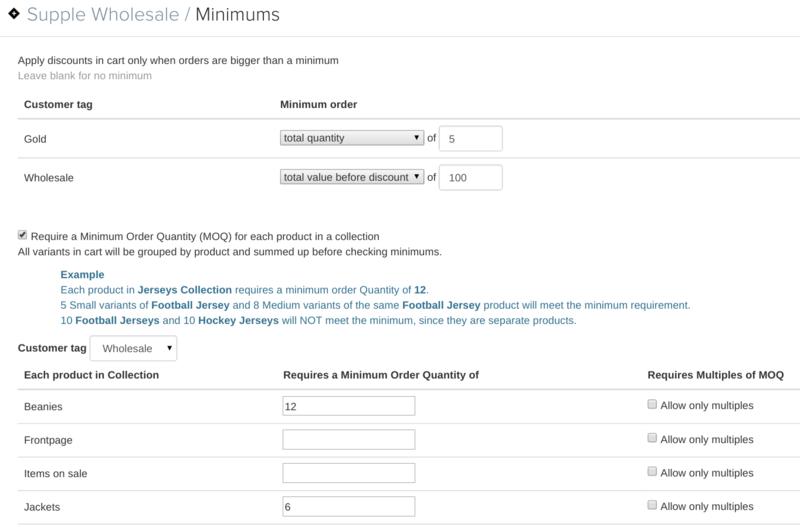 Advanced feature: require Minimum Order Quantity per collection (requires a one-time fee to activate). Offer additional discounts for large orders (requires a one-time fee to activate). Give staff a "heads up" that an order was a wholesale or membership order, by looking at the appropriate order group. Unlike other apps, there's no need to "pause" rules and wait before and after you update prices, or when you export or import products. Product price changes are instant. Newly added products take up to 1 day to be eligible for wholesale discounts. Our innovative approach has NO duplication of products or variants, which would have implied more work to manage inventory, fulfillment, or hide discounted variants from 3rd party shops (e.g. Facebook store or Google shopping). How do I work with Wholesalers? Wholesalers are regular customer accounts on your shop, tagged with the tag that you chose in Wholesale app (letters are case sensitive). Create a Wholesale page, which explains how potential wholesalers can work with you. Add it to your site navigation. What do I have to do to hide wholesale prices from Google Shopping feeds, Facebook shops, Pinterest? Nothing, they just work. This app does NOT create duplicated variants or products. Does this app work with other pricing apps, such as Sale Rack or Power Tools Pricing Policy? Yes! As we don't create variants or duplicate products, there are no extra updates required. Any price changes reflect instantly on Wholesale or Membership prices. Can I offer different shipping rates for wholesalers only? if you have free shipping for regular customers, we recommend to slightly decrease your wholesale discounts, so that shipping costs would be covered by product purchases. create a paid shipping rate for orders larger than an amount that regular customers won't reach, e.g. $300, and set a minimum $300 order amount for wholesale. use Net Terms Checkout, which you could name whatever you prefer, e.g. "Wholesale Checkout" (no need to offer net30). Choose to have term orders created as Draft. You'd then add another invoice line with desired shipping fee, and click "Email invoice" for customers to pay. Yes (for a $99 setup fee). In cart, net30 customers will see an option to Choose a Shipping Address and Checkout with Net30 Payment. Order will be created directly with wholesale prices, and the optional Extra fees/Shipping that can be set in app also apply. You will have to followup with the customer to collect payment, including potential variable shipping fees. ★★★★★ Great app and great company to work with! I tried several other wholesale pricing apps, and this is by far the best!!! Very easy to use and easy setup. Responsive and friendly technical support. Because the app uses discount codes (as opposed to product variant pricing), there is no downtime when making price changes or price imports.